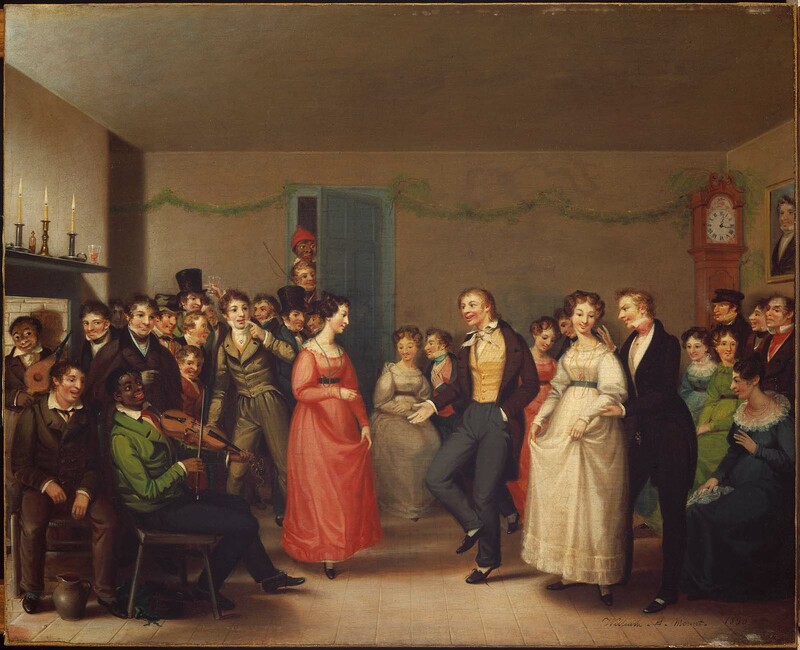 Rustic Dance After a Sleigh Ride, 1830. I don’t know about your weather, but we’re in full summer in New England, sultry and humid, with the occasional thunderstorm and power outage to enliven the evening. A sleigh ride sounds like fun today– and I know we all just finished complaining about the snow of February– but a brisk ride followed by a dance would certainly round out this week. 1833 approaches faster than expected, so it’s time to pick that back up and get serious. Not just a gown but petticoats and, ideally, a new shift should be made. This may be the project that breaks my resolve and finds the Bernina back on my table for cording a petticoat. This image helps define the look of the early 1830s: not nearly as exaggerated as the fashion plates, these dresses and coats seem to fall into a progression from the 1820s– as you’d expect this early in the decade. The gentleman at the back, in the drab colored suit, sports an interesting pair of trousers. I don’t think I know anyone ready to bust out the cossacks, but Mr Drab may be sporting a slightly modified pair. 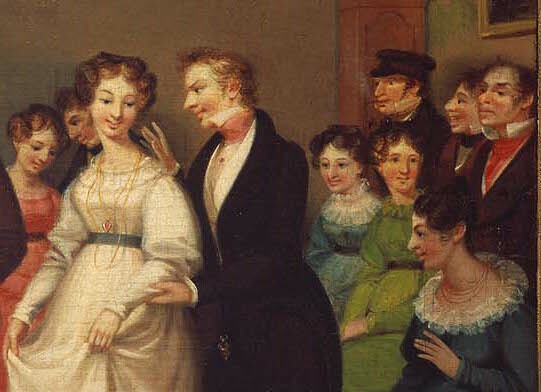 The collars and lapels show a shawl-shape that seems new, and modified from the more serpentine form seen in fashion plates– or else not yet as developed. There’s a range of headwear, too: tall hats on the left, a soft cap on the right. The Ladies’ Workbook has a pattern for one of those caps. Wonder how hard they are to make? In the detail, we can also see the women’s hairstyles, less exaggerated than the fashion plates with their high top knots, and within the realm of possibility for those of us not practiced in historical hairstyle recreation. So much has carried into this decade: colored neck wear, ruffles or chemisettes under women’s gowns, men’s hair brushed forward. As always, it’s the details that count. Tall shirt collars, rounded lapels, ladies’ sashes, the shape of sleeves. This should be a fun decade to represent. This is a line/look that I like. It has a relaxed feel to it, meaning I imagine feeling so relaxed in the clothes.